The scene before worship as we helped everyone stay safe through the ice and snow. Thanks to all who helped us keep our committment to Welcome All! Isaiah 6:1-13 Isaiah says, Here am I; send me. 1 Corinthians 15:1-11 Paul delivers in a nutshell the story of the gospel that was given to him. In the lineage of the Christian faith, we have received the good news of God’s love from generations of believers before us, and we continue to tell this story to the world. Luke 5:1-11 Jesus’ teaching of God’s word has begun to draw great crowds. For Simon, James, and John, Jesus’ teaching inspires hospitality, then obedience, and then risk. After Jesus’ creative power is revealed, fear and amazement lead these three fishermen to leave everything behind in order to become apostles. I believe we are in a time that requires hard work and huge faith. I believe the Lord is inviting us to a new adventure, but it’s out there, out from shore, away from our home waters, away from our comfort zone. I believe we’re being called to cast our nets in new ways. Yes, we can and should carry forward many of the ways that have fit us in the past. But we also need to be open to new ways, and new waters, even if they are deep waters. I pray we will continue to trust and obey, as we listen to the leading of our God of generosity and our Lord of amazing grace. Thanks be to God. Amen. Today is Scout Sunday at Cross of Christ, a time when we honor the troop that calls Cross of Christ home as well as all Scouts, past and present. Leader: On this Boy Scout Sunday, we would like to share with you a litany that speaks about the importance place of faith and Scripture in Scouting. It is called “On My Honor”. I ask all Scouts past and present to please stand and join in the litany. Scouts: On my honor I will do my best to do my duty to God and my country. Scouts: On my honor I will do my best to obey the Scout Law—and the Law is this: A Scout is trustworthy, loyal, helpful, friendly, courteous, kind, obedient, cheerful, thrifty, brave, clean, and reverent. Scouts: On my honor I will do my best to help other people at other times. Scouts: On my honor, I will do my best to keep myself mentally awake. Scouts: On my honor, I will do my best to keep myself morally straight. Leader: Scouting promotes values and actions that are consistent with God’s calling for all people to live honorable lives by serving others, promoting justice, demonstrating moral and ethical uprightness, and showing respect for the Divine. The Scouts of Den and Troop 673 are grateful for the support and partnership we have with Cross of Christ Lutheran Church in helping us teach, learn, and live these sacred values. Scouts, you may be seated. On the night in which he was betrayed, our Lord Jesus took bread, and gave thanks; broke it, and gave it to his disciples, saying: Take and eat; this is my body, given for you. Do this for the remembrance of me. Again, after supper, he took the cup, gave thanks, and gave it for all to drink, saying: This cup is the new covenant in my blood, shed for you and for all people for the forgiveness of sin. Do this for the remembrance of me. 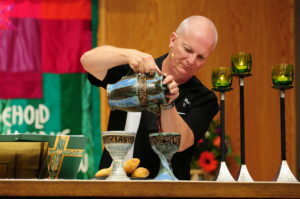 All are welcome to receive Christ’s Body and Blood in the Bread and Wine of the Eucharist. TODAY IS SCOUT SUNDAY – Cub and Boy Scouts and their leaders with Troop and Den 673 will worship with us today as we recognize our more than 50 years of partnership serving boys, and now girls too, in the Crossroads and Lake Hills communities. Welcome, Scouts! ADULT FAITH FORMATION TODAY – Cancelled today due to weather! CHILDRENS’ SUNDAY SCHOOL – Cancelled today due to weather! 2019 OFFERING ENVELOPES & YEAR-END STATEMENTS – Thanks to all for picking up your offering envelopes, and for your ongoing generosity and support of Cross of Christ. Uncollected boxes will be mailed this week. If you would like to have envelopes but do not find a box with your name, please contact Bookkeeper Denise Fuentes at 425-746-7300, ext. 107. Year-end Contribution Statements were mailed to all contributing members last week. If you do not receive yours soon, please contact Denise. Thank you. CofC HOSTING CONGREGATIONS FOR THE HOMELESS – Our month of hosting – swapped with St. Luke’s Lutheran due to ongoing construction there, from our usual month of May – is off to a good and important start, especially with the recent severe weather. Even when the office and all other activities were closed this week, CFH staff and CofC volunteers provided a warm meal, a warm place to sleep, and a warm welcome to men in our community who might otherwise have been out in the cold and snow. Thanks to all who have helped. There are many ways you can help. We welcome volunteers to come visit with the men, and we are also in need of people who are willing to come to set up. We ask for prayers for the men who are experiencing homelessness, the staff and volunteers of CFH. Please contact Ann Huseby, Jay or Kay Marsh, or Nadine or Sterling Bentsen to participate or to learn more. OFFICE CLOSED NEXT MONDAY FEBRUARY 18 – in observance of Presidents’ Day. The office will reopen Tuesday, February 19, at 9:30 am. Regular office hours are Monday through Thursday, 9:30 am to 2 pm. FAMILY & WOMEN’S EMERGENCY SHELTER UPDATES – The Family Shelter is now at St. Peter’s United Methodist Church at 17222 NE 8th Street. The numbers are lower now, averaging about 15, so if you have signed up to provide a meal, please check the calendar periodically for current numbers. The Women’s Shelter is now at Lakeside Christian in Kirkland, 701 1st Street. They average 40 to 45 women per night. 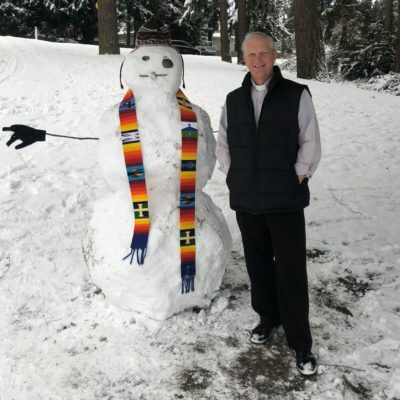 SYNOD ASSEMBLY & BISHOP ELECTION – The Northwest Washing Synod of the ELCA is engaged in a call process for our next Bishop. A new Bishop will be elected at this year’s Synod Assembly, May 17-19. Current Bishop Kirby Unti is not seeking re-election. There are several ways you can be a part of this very important process. First, the Synod is seeking input from members via an online survey. All members are encouraged to complete the survey by February 16. You can also nominate someone for the office of Bishop. The nominee must be a member of the ELCA Word and Sacrament roster (ordained pastor). Nominations also must be received by February 16. Take the survey, make a nomination, or find out more at the Synod’s website – www.lutheransnw.org/BishopElection. Cross of Christ is eligible to send both Pastor Dave and Pastor Judy along with up to four lay members as voting delegates to the Assembly. Others may attend as visitors (no voice or vote privileges). Cross of Christ may send to the Assembly one female and one male delegate, one youth and one young adult delegate. 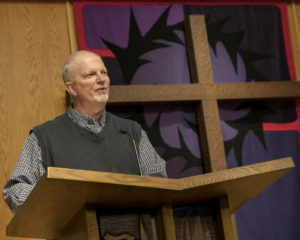 At our last Annual Meeting, the Congregation voted to delegate the selection of Assembly delegates to the Church Council. If you are interested in being considered as a delegate, please speak with Pastor Dave or Council President Gale Hill, council3@cofclc.net.